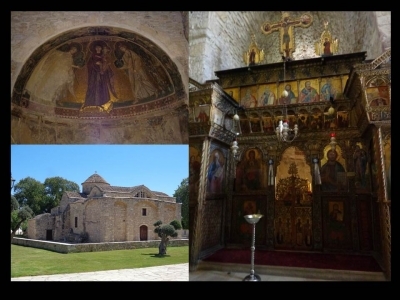 Church of Panagia Aggeloktisti is part of the Tentative list of Cyprus in order to qualify for inclusion in the World Heritage List. This small church is located in the centre of Kiti village, a ten minute drive from Larnaka international airport. Access is free, providing the church is open – so it was when we visited it the day before Palm Sunday in 2018. The inside is richly adorned, and the masterpiece is an old mosaic with gold background, depicting the Virgin Mary. It is said to be from the same period as the one in Ravenna (Italy) and Sinai (Egypt), however, it is much smaller, so do not expect too much. The mosaic can only be seen through the gate of the iconostasis: beware of not missing it! In fifteen minutes you have seen it all. As for most of the places we visited during our trip in Cyprus, building is very well maintained, the place is easy to find and park. A small restaurant nearby also offers toilets, and green area with trees around the church provides shadow during the hot days. We enjoyed that visit, however, it is difficult to imagine that this church could be one day inscribed on the WHS list. The Byzantine church is the only highlight in a small town called Kiti, just a few minutes from the airport of Larnaca. I visited it before returning my rental car, after I was done with my travel program in Cyprus. I doubt this will make the list. The church looks like many other Byzantine churches. Few wall paintings are still visible. The iconostasis mentioned in the description is a removable object, so no strong case for inscription. Every single Troodos church I visited was much more outstanding than this church.